They may not look like much to you, but they’re a dream come true for the Historical Society! 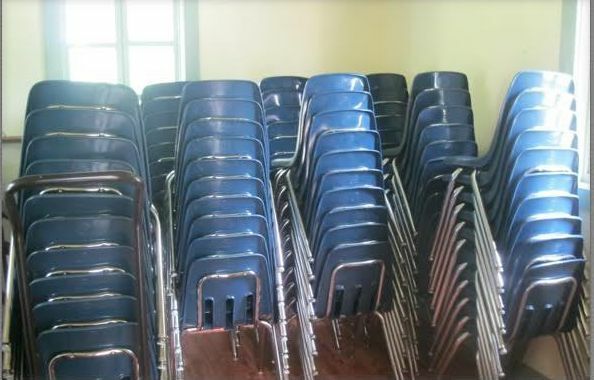 A grant from the Frances T. Bourne Fund at The Community Foundation of Sarasota County has provided for the purchase of chairs to expand our seating capacity in the Crocker Memorial Church (1901) and in the Bidwell-Wood House (1882). More seating for members meetings, for weddings, seminars, music and theatrical rehearsals, for local club meetings and for community-wide events, such as Conversations at The Crocker. 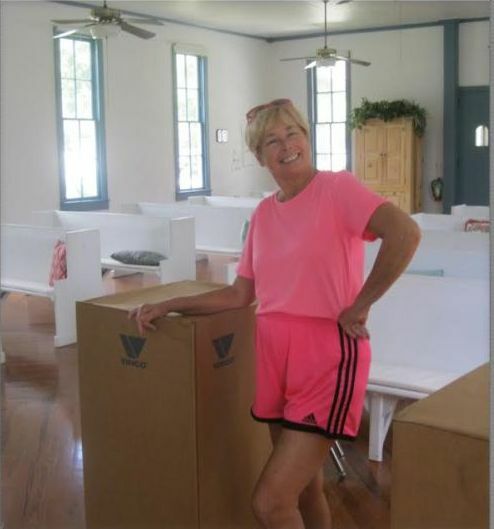 Our Vice-President, Marsha Fottler, came dressed to work, the day the chairs arrived via semi! Besides serving the needs of the Historical Society, the Crocker Memorial Church building is available for rental and is equipped with a sound system, projector, black-out shades and now seating for 150. The historic structure is a popular destination for weddings and other celebratory events. The Historical Society considers the Crocker a model of adaptive use. Since 1901 it has been in constant use, first as a house of worship and now as a place that HSOSC and the Sarasota community use for a variety of programs and events. The Crocker has been preserved by being useful over a long span of time. Funding for these chairs provided by the Frances T. Bourne Fund of the Community Foundation of Sarasota County. This entry was posted in History Fun and tagged Conversations at the Crocker, Crocker Memorial Church, Pioneer Park, Sarasota. Bookmark the permalink. ← What’s your treasure worth? Thanks! Hope you get a seat for yourself at the next Conversation with Jeff LaHurd!